Home Equestrian News Niels Bruynseels wins the Helsinki Gran Prix. Niels Bruynseels wins the Helsinki Gran Prix. The winners – Niels Bruynseels and Gancia de Muze. Photo Satu Pirinen. 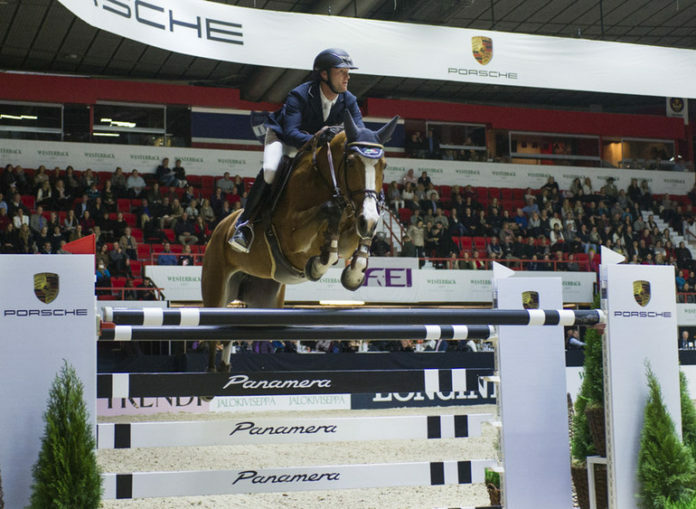 On Saturday afternoon was yet again time for the world’s best riders to compete in the Helsinki Gran Prix. Belgian Niels Bruynseels with Gancia de Muze managed to make the fastest clear rounds winning the competition their winning time being 36.73. – My horse was really good today and I’m happy with the result. My plan was to go fast and I knew I had to take risks left and right since I knew that Scott was really fast, says Bruynseels. – The course was very technical and delicate course for the horses. The course designer did a very good job today, Bruynseels praised the course. The second place went to Scott Brash on Hello Guv’Nor and the third was Philipp Weishaupt with Carvagio Z. – My round went very well and I was happy with my horse – he jumped fantastic, Scott Brash says satisfied with his result. – I don’t really know how I could have gone it any faster – maybe from two to three I went six strides when I could have done five. Nils did an amazing job and a fantastic round, Brash praised the winner. Niclas Aromaa with his horse Chairman 20 was the best home rider and managed to get through to the jump-off and placed ninth in the results. – First round was great and my horse did really well. The fact that the horse did so well and within the target time was a nice surprise. In the jump-off the only goal for me was to do a clear and see where it takes me. Today it was not enough to win, but I’m really not disappointed, says Aromaa. Finnish Emma Tallberg debuted in the five star grand prix level and did a great round with only one fence down. – I’m super happy. I really did not have any big expectations for today and my aim was to have nice round with a good feeling. I only had one down which I’m very happy about, tells Tallberg. – Without the time I spent in Switzerland I for sure would not have been able to start in the Grand Prix today, Tallberg also mentioned. Previous articleLeslie Burr-Howard locks up two in a row with a win in $35,000 Keystone Classic at Pennsylvania National Horse Show. Next articleScott Brash’s great day continues in the International 150.